When Lisa Marie and her step-brother Vernon pop into town to get their dad a birthday present, they discover the Create-a-Ted shop is offering free Halloween bears! Making two grisly bears for themselves and choosing an Elvis bear named Bearvis for Dad, they head home. That night the shopkeeper brings the bears to life for nefarious purposes … but Vernon’s bear, Grizz, doesn’t want to be a slave to humans – he wants to rule the world! Converting the shopkeeper’s Stuff-U-Lator into a machine for turning living matter into stuffed bears, he begins to prowl the streets. Can the children and Bearvis save themselves – and the world – from being stuffed? WARNING: No Teddy Bears were harmed in the making of this book - they were only stuffed! One of the most asked questions we receive is: what books would you recommend for readers around the ages of six or seven that have a scary element to them but are not ghost stories? This for me would be a good start to answering this question. 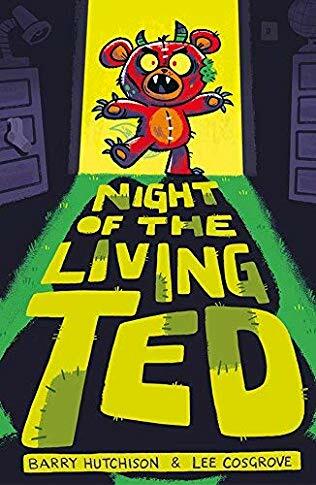 It is the latest book by Barry Hutchison entitled Night of the Living Ted. The first book in a brand new series, this has already been published by Stripes Publishing and is out in shops now. The book has been illustrated by Lee Cosgrove which makes it even more fun and appealing to this particular age group. The illustrations add life to a story that is already brilliant and very enjoyable. The book cover image is especially clever; it really gives the reader the idea of what to expect inside the cover. For me, it captures the essence that you will definitely love it and, if you don't then we will set the teddies on you. YOU HAVE BEEN WARNED. Only five-star ratings on Amazon PLEASE. This book will provide great family entertainment. However, it also depicts the relationship between step-siblings and the feelings they have between each other. It develops another side to the story which just adds a little element of thinking. You will never look at a Teddy Bear in the same way again. Those glassy eyes will be staring at you in a sinister way - you might want to watch your games console, just in case .... You'll certainly want the planet to be saved from these cuddly monsters. This is a five-star book full of fun, laughter and much much more .... Just watch your step and remember no teddy bear is to be trusted!